— Opposition mainly from areas north of the local streets. — Parents of younger children more supportive of measure. Dublin City Council officials and local residents want to keep bollards aimed at cutting rat-running on a number of streets in Drumcondra — although, a resident’s group from a neighbouring area wants the street open to through cars again. 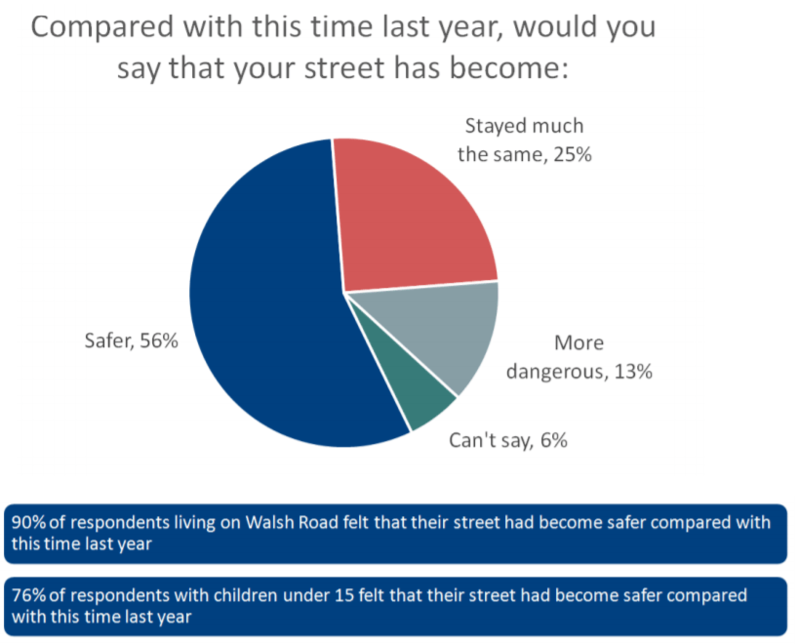 The Walsh Road traffic calming scheme trial was at first controversial among many local residents, but a survey for the council shows that a clear majority of local residents now support the scheme. Local supporters of the scheme also told IrishCycle.com that there a has been a change in mind among many residents after they saw the positive effects. The survey of 204 households in the area, carried out on April 25 and April 28, found that the majority of people are now very satisfied with the level of traffic on their streets, and only a minority were dissatisfied or very dissatisfied (5% and 21%). It was conducted by Delve Research using random face to face interviews. Overall 56% respondents viewed streets as being safer compared to last year, and 25% said said safety stayed much the same, while just 13% said the streets had become more dangerous. 6% did not know. Residents with children under 15 were more likely to think streets were safer with 76% of them viewing that the streets are safer compared to a year ago and the same number viewed the measures as effective. The council’s report said that the bollards were put in place after safety concerns over rat-running and inline with national policy and the city’s Development Plan. The council said that the elimination of through traffic has significantly reduced the risk to pedestrians and cyclists using the roads, and has lessened the use of footpaths for parking — there is now a perception of more children walking and cycling to school, and an electric wheelchair user told the council that they were feeling much safer going to the shops or doctor. “With the implementation of the traffic calming scheme, some of the private motorcar trips which previously used Walsh Road have dispersed onto a number of other streets in the vicinity of the scheme. The volume of traffic on these surrounding streets is more proportionate to their size and nature and the footpaths are generally less impeded than the footpaths of Walsh Road and Ferguson Road. Therefore the increased traffic on these roads has not impacted on pedestrian safety on these streets where conflicts among the various road users less are likely to occur,” Walsh said in the council report. The council said that maximum average increase of approx 39 seconds to bus route is “regrettable” however it does not override the health and safety benefits, and the city-wide bus priority team continue to monitor bus times, the team is responsible for enacting bus priority measures. The council said that there were issues with the option of turning streets into one-way streets instead of bollards, including the likelihood of increasing the speed people drive at. The issue is due to be discussed at the North West Area Committee this Monday. The Walsh Road Traffic Action Group and Drumcondra Triangle Residents Association both support the bollards, while the Griffith Avenue and District Residents Association are objecting to anti-rat-running measure, outlining that the bollards are too extreme. Both groupings are lobbying local councillors. “There has been a lot of fake news from outside the area, from self interested pressure groups, wishing to have their ‘rat running rights’ restored. Please recognise this for the selfish desire that it is. This is people claiming an entitlement to destroy the quality of life of a community, to suit their motoring/commuting convenience. It is a shameless belief in an imagined ‘privilege’ to disrupt the lives of another community,” they said. Griffith Avenue and District Residents Association (Gadra) claimed that the bollards are in breach of planning laws because it was a “10 month trial with barriers in situ, instead of the originally stated 6 months”. Gadra used Freedom of Information (FOI) to obtain letters from the HSE Millmount Health Centre complaining about how the bollards mean that visitors to the health centre have to walk 200 metres or use the busy Drumcondra Road to drive around them, and complaining that nursing staff on home visits have further to drive. Because personal details are blanked out on the FOI, it is unclear who wrote these letters of complaint, what position they are in or if the complains about needing to give directions around the bollards were just a short-term issue. The Gadra group also took exception to survey mentioned above asked why it was conducted, how much it cost, who approved it, why residents from a wider area were not included and was the project value for money. Gadra also took issue with the lack of focus on their petition with 1,780 people against the bollards — however, while Dublin City Council did not comment directly on this petition, the council policy is not to holsuch because they are viewed to be often signed by people who do not want to upset neighbours. IrishCycle.com previous reported how the Gadra said it was “not anti-cycling” but its AGM report noted that it objected to a plan for a walking and cycling route. There’s a surprise,people who live near or on a rat run find an improvement to quality of life and now support the change and those who don’t care about the area but want to use it as a shortcut are opposed to it. Its a pity the corpo could not do a similar test on the proposed south side quiet way and show residents how it makes life better. Instead of consultation which just harvests prejudices and brings out the agitators we should go for short tests which show what improvements can be made. Good to see peoples’ minds were changed when they saw the positive results. I hope more areas effect these changes. Really good article Cian. It’s a very fair summary. I would add that the group GADRA representing Griifith Road opposed the traffic calming trial right from the outset. They wanted it stopped before it began. First they claimed it was not transparent. Anyone who lived in the area would totally disagree with that. The options for the trial were displayed in the local Library for months. DCC leafleted the area twice to encourage people to attend. Local politicians put out leaflets urging people to visit the Library and provide feedback. DCC officials and reps from the traffic consultants AECOM who prepared the evidence based report spent two full days in the Library answering concerns. It was discussed at length on local social media. When the pilot scheme started, they organised a petition far and wide from the area against the trial. They were not willing to wait for the trial and consultation period. They obviously knew that once the calming scheme was in place that more and more people initially skeptical would see the huge benefit. Many of us here hope that the calming measures will be made permanent and safety will win out over people who want a convenient short-cut. Thanks Sean. That’s good information to have. I very much doubt they give a damn about nurses or patients attending primary care. They want to drive their cars through other peoples residential areas for nothing more than purely self centred reasons. They are willing to lie to get their way. They should be ashamed of themselves and it’s great to see these sort of people not get their way for a change. Good example of a large, influential, well-resourced and vociferous group attempting to use any means necessary to attempt to undermine a positive development that they consider to be against their self-interests and to browbeat any opposition into accepting their position based on misinformation and spurious contentions before they have a chance to make up their own minds. Looking at the map, it is clear that the Walsh Road area is a handy shortcut for Griffith Avenue drivers to largely avoid Drumcondra traffic on their way into work or on the school run and that is what this is all about. These are narrow residential roads that should not be used in this way by large amounts of non-local traffic. Perfect for bikes though; perhaps they should reconsider their options? We need to bear in mind that rat-running is tacitly accepted by road/traffic engineers simply because it acts as a buffer to distribute as many vehicles off heavily congested main arteries so as to prevent junctions going into grid-lock. There is no official or political will to alter this. I don’t doubt that you are correct that rat-running is regarded as a means to provide some congestion relief, but this project is itself a move away from continuing to tolerate that practice. If it can be shown to be a popular and successful initiative, then it will add to the momentum behind similar projects elsewhere in the city and beyond. Ultimately, small steps such as this are vital to lay the groundwork for a sustainable transport system into the future. As minor roads such as these open up for non-vehicular traffic, it will allow people to become more comfortable with walking and cycling instead of taking the car. And as arterial routes have proper bus and cycle facilities installed under Bus Connects, more and more options will become available to avoid making car journeys. Traffic levels always auto-correct to take account of changes to flow patterns, and gridlock will be avoided without the need for rat-runs. @bigx, in relation to the South Dublin Quietway, DCC didn’t block progress. This was blocked by a small number of councilors in a sub-committee for the local area. To be fair to DCC, it was looking for a modest allocation of funding (€15k) to engage with the local community, to find options that would work and be generally acceptable. I’m delighted for the people living in Drumcondra that they at least got the opportunity to experience what it can be like when cars are restricted on their roads. It’s not surprising they want to keep it that way. I don’t see anything in my earlier note that blames DCC for the lack of progress. The point I was making is that consultations and surveys mobilise opposition from people outside the area at a time that the benefits to the local community are not obvious. If there was a way to run the test like piggybacking on local roadworks and then have the consultation when people can see the way their area can be improved and will be willing to argue for it we might make more progress. All our local councilors endorsed the (glowing) DCC report yesterday – our bollards have been made permanent! We are over the moon!!! Sometimes the small guy does win. Now to push on the South Dublin quiet-way. @MamNotMum You should get in contact with Cllr Paddy Smyth and give him some insights on methods or experiences which you think helped in your area, so that the quietway in south Dublin might have more of a chance. This approval of the traffic calming measures is a huge victory for the local residents who have campaigned for such a barrier-based solution for years. One neighbour remarked that we have waited for 25 years. For many of those years we were fobbed off with ramps, signage and the occasional Gardai check once a year. We will no longer have to suffer 1000+ cars coming through this area on a daily basis. I want to express my gratitude for all who have supported us here. Cian deserves special mention. He should be awarded the ‘Freedom of Drumcondra Triangle Estate’. In very early days of the trial which started in late August last year, there was a backlash on local social media. Cian systematically answered all opponents until their only argument was their ‘democratic right to rat-run’. I also want to thank the DCC officials in this area and the traffic engineers who implemented the traffic calming measures. They did this despite personal attacks on their integrity and on the integrity of the scheme. I hope that the success of this scheme will have encouraged the same officials to roll out similar schemes throughout this city. More children are cycling in the area; I am told that St. Patrick’s Junior school has run out of cycle stands. We are hopeful that these measures will encourage a new generation of cyclists in this area. I want to thank the local people posting here. It is good to see proof that the people who were claiming to represent all of you against the evils of quiet living were lying. I’d encourage you to write these sentiments in a letter to the council, your TD and whoever you can too so that they also have evidence that they made the right decision. I’m sure they are getting letters deriding the decision using all sort of spurious reasoning and lies right now as a first step in the campaign to get this decision reversed. Make sure those concerned know that there is support for this scheme as well as opposition. @ Eric – Believe me, we have thanked (and will continue to thank) those officials & politicians who chose safety over convenience. This has been a long and at times bitter campaign. A local pro-car residents association threw EVERYTHING at this – used every political connection they had and stooped to misinformation, lying and intimidation (I wish I was exaggerating). According to the local councilors & officials, as the trial went on, and more people were won over, the proportion of pro-bollard messages & emails went up and the number of complaints declined so that by the end they were receiving mostly supportive messages. A good day for Dublin and hopefully the start of something bigger – apparently DCC have received requests from 30 other areas in the city for similar measures! That’s great to hear! Thanks for getting involved. If there is a lesson to be learned from our experience it’s that many residents associations are not fit for purpose. Many (most?) are dominated by conservative thinking people with plenty of time on their hands and the rest of us left them too it because we were too busy/ not that interested. Hands up – before this campaign started I paid no attention to local flyers coming through our door and I wouldn’t have bothered going to a residents association AGM. Those days are gone!!! !